On Thursday, June 23 in the Rye Neck High School gymnasium, 107 seniors proceeded up the half court line on the same basketball court where many of them took their physical education classes and competed as student-athletes only weeks earlier. Family and friends of the graduates filled the bleachers on the outskirts of the gymnasium as others had a closer view from the countless rows of chairs set up on the hardwood floor. Of the 107 graduates of the Class of 2016, 96 percent are moving on to some form of college or continuing education classes, 51 were inducted into the National Honor Society and 23 were designated as AP Scholars after completing the requisite coursework.A common theme made by numerous speakers at this year’s commencement ceremony was the relatively small class sizes the school district accommodates each year in a district spanning two municipalities: the city of Rye and the village of Mamaroneck. Rye Neck High School Principal Dr. Barbara Ferraro served as the master of ceremonies and offered complimentary words to the graduating seniors. Salutatorian Theresa McSweeney started her remarks to her fellow graduates with a simple question. “Is it conceited to say that I think we’re a pretty awesome group of kids?” Sweeney asked, to which her classmates—and even some faculty members—responded with a thunderous applause. McSweeney concluded her remarks by encouraging her classmates to give future endeavors their best effort, despite the fear of the unknown and the trepidation of making mistakes. 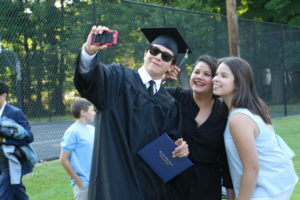 This year’s ceremony marked the third year of the Rye Neck keynote speaker series “Ten Years After,” a highlight of the event that featured a Rye Neck alum returning to their alma mater to discuss the world, as they experienced it, a decade after their graduation. This year’s speaker was 2006 Rye Neck graduate and standout athlete Michael Dearwester. Dearwester attended Dartmouth College where he majored in history and played on the football team, before advancing to Duke University and obtaining a master’s degree in Business Administration. In his speech, Dearwester recalled the culture shock of leaving home and attending a school where he wasn’t the largest person on the football team.